"strength" tops the list. 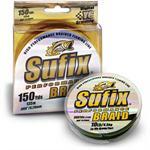 Sufix® Superior™ is incredibly strong with one of the highest tensile strength ratings of any premium monofilament. And no other mono offers the low stretch and fast recovery of Superior.